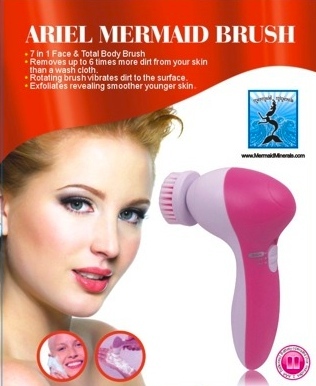 The Ariel Mermaid Skin Cleansing System® is here! A small lightweight skin cleansing system. Nothing has been minimized on the results, but the price will have you smiling! This little wonder brush vibrates dirt to the surface and gets up to 6 times more dirt off your skin than a wash cloth or any other topical scrub pad. Those pads only clean the surface leaving dirt deep in your pores, which cause pores to stretch thus creating sagging skin as well. Mermaid Minerals wants you to have the best skin possible and we are committed to helping you in many ways. You will get the best results from using our nourishing & toxic free products with the Ariel Mermaid Skin Cleansing System®. The main process when you are getting a facial at a spa is to cleanse & exfoliate the skin, to prepare it for the product that is applied. Skin that is properly exfoliated will absorb the skin treatment product more rapidly and will yield a better result. The rotation of the brush head removes dirt and debris and leaves you with instant results that you can see and feel. We know there are other higher priced facial brushes out there that spend a lot of $$ on advertising! But the concept is really simple. The gentle rotation action of the brush will massage the skin, vibrate dirt to the surface, exfoliate and reveal smoother younger skin and you don’t have to pay hundreds of dollars to achieve that result! You can also use your brush to apply serums and lotions, as the rotation of the brush will help the product penetrate deeper into the skin. Affordably priced. Buy one for yourself and more for gifts! Now get a second Ariel Mermaid Skin Cleansing System for only $2.00 more! • Reduce the appearance of visible pores by regular use. Remember to use on back! Great for prevention of back acne! For him or her! Great for Teens! 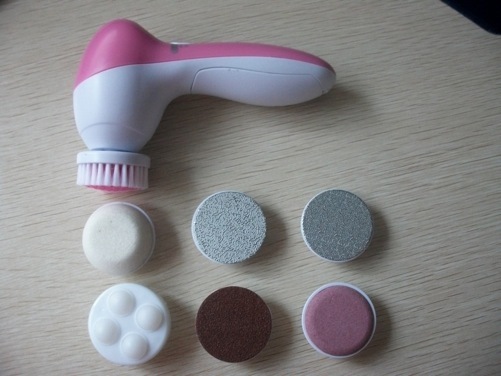 The facial brush is made of very soft bristles, specially designed for tender face skin. First cleanse your face with one of your favorite Mermaid Minerals cleansers (Click here to find one), by hand or wash cloth to remove initial make up. Then apply a small amount of cleanser to your face and apply the Ariel Mermaid Skin Cleansing System® brush to your skin. Do not press hard onto your skin. The small brush will do the work for you. Gently move the brush across your face while making circular movements. Place the brush flatly on your face to ensure evenness of the treatment. Don’t forget the backs of your hands, as they are one of the first places to show aging! The facial sponge can be used to massage your face to prepare for moisturizer. Facial massage can aid in activation of your skin’s natural propensity for elasticity. Also it will help your skin to absurd moisturizers and serums. The pumice attachment removes hard cells at elbows and on your feet. Remember to do your heels! Pretty and smooth feet can be yours with regular use. Don’t forget the backs of your hands, as they are one of the first places to show aging! Use your shower gel or cleanser in the shower with the Ariel-it’s water resistant. Clean the unit and the applicators each time after use. DO NOT USE ANY ALCOHOL, ACETONE, PETROL OR ABRASIVE CLEANING AGENTS, ETC., TO CLEAN THE PLASTIC PARTS. Rinse applicators with tap water, maximum temperature, 50c or 122F. Use damp cloth to wipe down body.